Doctors Hesitant To Deal With Patients' Weight Problems : Shots - Health News Most family doctors don't do the math to figure out whether their patients are obese. It's one reason among many that doctors on the front lines are unlikely to be the solution for country's weight problem. In 2010, there were 78 million adults classified as obese in the United States, and roughly 164,000 primary care doctors to take care of them. It doesn't take a math wizard to figure out that doctors who handle routine care, although they may well want to help their patients lose weight, are unlikely to have the time to provide the kind of intensive coaching to that would help their patients make a lasting change. Newly revised guidelines for obesity screening and weight management from the U.S. Preventive Services Task Force acknowledge that fact. The guidelines recommend that clinicians screen adults for obesity and direct patients whose body mass index is 30 or higher to intensive weight-management programs. They note, however, that "intensive interventions may be impractical within many primary care settings," and suggest that patients should instead be referred to community-based weight-loss programs. Even if they don't do the actual coaching themselves, primary care doctors have an important role in the battle against the bulge: Screening patients for obesity. 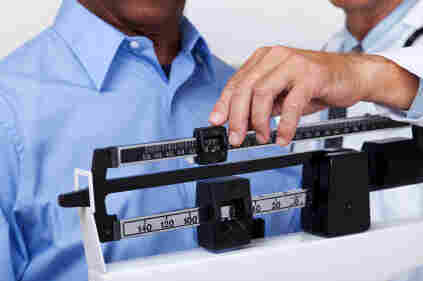 What that generally means is computing patients' BMI, which is based on their height and weight. Unfortunately, only 30 to 40 percent of family practitioners compute their patients' BMI on a regular basis, according to the American Academy of Family Physicians. Even if doctors weigh their patients, they often neglect to measure their height, say experts. One of the reasons may be that conversations between patients and doctors about the subject of weight can be sensitive. Patients sometimes complain that their doctors attribute every health problem they have to excess pounds, says psychologist Patrick O'Neil, director of the weight management center at the Medical University of South Carolina and president of the Obesity Society. "Patients say, 'I could go to the doctor with a hangnail, and he'd blame it on my weight.'" Doctors, on the other hand, say some patients take offense at the mere suggestion that they need to lose weight, he notes. "It's a minefield for both sides," says O'Neil. He says the new guidelines offer reinforcement for the perspective that obesity screening should happen in the primary care setting. "The physician is in the best position to judge someone's weight in the context of their overall weight trajectory, because if you gain as an adult you're at risk for other conditions like diabetes," he says.